Most simply stated, Photoshop™ actions help you make your photos more awesome and do it much faster. They are like a magic wand that instantly recreates of all the commands and steps used to achieve an effect in Photoshop™ or Elements™. WHY SHOULD I USE ACTIONS? Actions can be replayed at the click of a button, saving you valuable time editing as well as creating complex effects with ease. When using actions extensive Photoshop™ processing knowledge is no longer required to get professional, beautiful results. Essentially, actions take the hard work out your workflow. They help you maintain consistency in your edits while speeding up your editing process so you can get back to doing what you love. Actions save you time, simplify your workflow and help you unlock the true potential in your photos. We have actions for all types of photography – whether you’re a portrait, maternity, newborn, children, family, floral, or engagement and wedding photographer – we’ve got you covered. Browse our extensive collection of video tutorials, blog articles and eBooks to help guide you through the editing process. From hobbyist to experienced professional, our actions are easy to use and just as powerful and customizable. Our actions are compatible with Photoshop CS2, CS3, CS4, CS5 and CS6; Elements 6, 7, 8, 9, 10, 11, 12, 13, 14, 15, 16, 17, 18 and 19 as well as Adobe’s new Creative Cloud (CC). They are also compatible with Mac or PC systems. Installing Actions into Photoshop CS2, CS3, CS4, CS5, CS6 and CC (Creative Cloud) for PC or Mac. Installing Actions into Photoshop Elements 11 or newer for PC or Mac. Installing Actions into Photoshop Elements 6-10 for Mac users. Installing Actions into Photoshop Elements 6-10 for Windows PC users. CLICK HERE to view or download the Action Guide for Installation, Tips and Troubleshooting for Photoshop CS2-CS6 plus CC (Creative Cloud). CLICK HERE to view or download the Action Guide for Installation, Tips and Troubleshooting for Photoshop Elements for PC. CLICK HERE to view or download the Action Guide for Installation, Tips and Troubleshooting for Photoshop Elements for Mac. Create a rich, colorful look with warm sunbeams using The Reverie Collection. Moody, velvety color edit using The Reverie Collection. Enhance and create rich bokeh/blur in Photoshop using The Reverie Collection. Dreamy Beach Edit in Photoshop With Added Sky and Sun Overlay using The Reverie Collection actions and overlays. From drab to fabulous – easily add a vibrant sunset sky with The Reverie Collection actions. Add warmth, color pop to add interest and brighten up shadows using The Reverie Collection actions. Using The Reverie Collection‘s special actions for hazy or backlit photos this edit adds back some pop and vibrant color, and some extra drama with a warm sunflare overlay. Learn how to extend your canvas (make your sky area larger) and replace the sky with a pretty sunset overlay and sunglow using The Reverie Collection actions and overlays. A beautiful, rich black and white matte finish using The Reverie Collection actions Lush BW. The Reverie Collection actions and overlays. Newborn edit using The Grace Collection actions. Create a soft, filmy look with a light, airy finish and a blanket fade. Color correction on some purple tiny toes also shown. Classic black and white edit using The Grace Collection action Clean Slate (Make It BW layer on). Options for clean color process or black and white in a single All-In-One base action. Created with the Opulent, Smolder and Apricot Light Blossom actions from The Grace Collection using Photoshop. Add drama, color toning and a movable sun glow. A quick edit using The Grace Collection in Photoshop Elements. Edited with the Opulent Action from The Grace Collection using Photoshop. An overview of The Luminosity Collection. 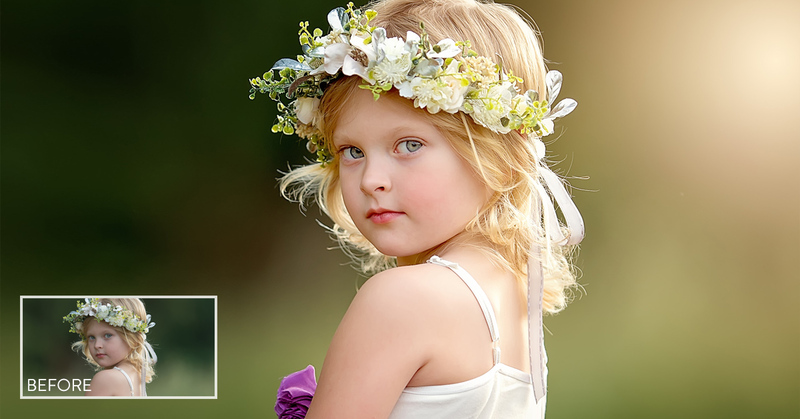 Learn to create a beautiful rich color, clean processed look in Photoshop using The Luminosity Collection. Learn to create a moody matte look in Photoshop using The Luminosity Collection. Watch newborn photograph processing in Photoshop using The Luminosity Collection (available for Photoshop and Elements). Using Photoshop and Paint the Moon actions for retouching and workflow. All In One edits plus manual editing methods to remove a stray hair in this bridal edit. Follow along with this newborn photo edit using Photoshop and Paint the Moon Picture Perfect actions. feel free to contact us. – we’re always happy to help! What version of Photoshop do I need for Paint the Moon Actions? Paint the Moon Actions are available for Photoshop CS2-CS6, Photoshop Elements 6 and higher, and Photoshop Creative Cloud (CC). *Paint the Moon Actions were created for use with English language versions of Photoshop and therefore may not be compatible with non-English versions. Unfortunately, I will be unable to offer technical support on non-English language versions. Do your Actions work with Adobe Lightroom? Actions are designed to work with either Photoshop or Photoshop Elements and at this time I am not offering Adobe Lightroom Presets. Keep checking back for Lightroom presets in the future! Are Paint the Moon Actions Mac compatible? Yes, Paint the Moon Actions are compatible with both Mac and PC. *Elements Actions are not compatible with Photoshop Elements when purchased from the Mac App store as it is a pared down version of the software and missing key functions that allow any action to be used. Is pricing listed a one-time fee? What currency is pricing in? Pricing is a one-time payment and you’ll never be charged ongoing fees. As a US based company, pricing on the site is listed in US Dollars. For current exchange rates you can search xe.com. As soon as your Checkout payment completes, you will be sent an email with download links. Rest assured, you’ll have your new goodies within seconds! I want all Paint the Moon customers to know they are getting the best pricing everyday, so I typically do not offer sales. While sales are rare, there are savings to be had when you purchase Actions in a bundle. For more information on Paint the Moon bundles, please click the link below. Due to the digital nature of these products there simply is no way to return or exchange products once they have been downloaded, therefore, I am unable to offer any returns or exchanges. That said, I strive to make sure every customer is happy and satisfied, so if you have any questions or concerns on your purchases, please contact me. We are always happy to help. What happens if I upgrade from Elements to Photoshop? The good news is Elements Actions will work in Photoshop. That being said, seeing how they were created for Elements and not Photoshop, they will be limited and will not be able to take advantage of the advanced tools and features which are exclusive to Photoshop. For those customers that want to upgrade their Actions to get the most out of Photoshop, I do offer an upgrade option. Should you decide to upgrade your Actions, please contact me and we can work out the details of your specific order. What happens if my computer crashes and I lose products I’ve ordered? If you’ve purchased actions previously, there is a great chance you have an account on the Paint the Moon site. Simply click the My Purchases link here or at the bottom of the site to log in and download your actions anytime on demand. Should you experience any issues logging into your account, or you don’t have an account, please contact me with the transaction ID of your purchase (located within your PayPal/Amazon transaction history), and I should be able to locate your purchase. Can I transfer my products to a new computer or will I be required to repurchase? Actions can be easily transferred to a new computer. Once again simply back up your purchases on a DVD, CD or flash drive and then transfer your Actions to your new computer. Do you actually use these Actions for your own photos and client work? Yes!! I adore these Actions and wanted to share them with all of you. I use all of my Action sets on a daily basis. They are incredibly adjustable and user friendly, and it’s wonderfully easy to mix and match for unique looks and needs. I’m dedicated to responding to my customers in a timely manner. I’m happy to help with all your questions, but technical questions, support and other customer service related messages are a priority. Please note, if you have a question regarding general photography advice, camera gear, etc., I’ll reply to you just as soon as I’m able!